Another month, another hurricane in the southern United States. News channels showed drone-captured video of the mess left behind in Northern Florida, Georgia and the Carolinas. More useful is the video damage assessments UAVs are providing for first responders. A basketball hoop and backboard hang forlornly while both front and back walls of a school gym are gone, huge buildings are nothing but matchsticks, fallen trees and powerlines blocking roads — familiar scenes from hurricane Michael’s devastation of Panama City and area — video provided by drones operating in the disaster zone. Although the videos have now largely gone from the TV news, Panhandle residents will be living through this nightmare for months to come. Working with emergency teams — including the North Carolina Surf City Fire Department, Airborne Response, Florida FEMA Task Force and Missouri Task Force FEMA — Edgybees’ AR drone software was able to provide collaborative, real-time, situational visualizations of the areas affected by Michael. Status and location updates were available during critical missions, and key geographical data was provided to teams on the ground. Another life-saving drone application comes from the other side of the Pacific – finding and deterring sharks which threaten bathers off the beaches of Australia. An artificial intelligence application on-board a SharkSpotter UAV monitors for shark attributes as it overflies inshore areas where the predators are known to hunt. If there is a match for typical shark behavior — size, shape, color, and movements in the water — an alert is transmitted to enable lifesavers to respond. The drone can even drop a flotation device to swimmers in trouble. A number of beaches in New South Wales were patroled this past summer, and many more UAV beach patrols are planned to be added for the coming season. Other work is underway to deter the animals using devices in the water which create electric fields aimed at interfering with shark sensory systems. Another cell-phone application estimates the probability of the presence of sharks based on a number of environmental factors. Several U.S. agencies are keenly watching these developments as shark attacks have increased here, off both Atlantic and Pacific beaches. Meanwhile, there has been another important step forward for drone integration into the US National Airspace System (NAS) and for integration in other countries’ airspace. Enabling drones to fly over people and property is a key part of potential airspace operations, and a safe recovery system which avoids possible injury to people is becoming essential. Most drones have a return-to-base fallback in the event of loss of the control signal, but this doesn’t help in the event of a fundamental mechanical failure. Effective auto-release parachute systems may be key to solving this problem. Another supplier has emerged with a lightweight automatic system for the DJI Matrice 600 multicopter. Drone Rescue (DR) from Austria has announced its DR-10 parachute recovery system,for drones weighing 5-20 kg (11-44 lb). 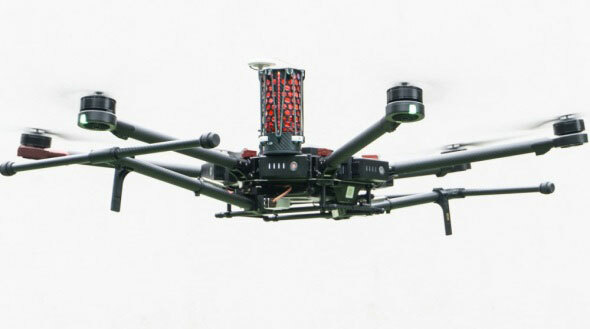 The DR-5 system is for lighter UAVs (8kg – 17.6lb). The DRS-M600 system has apparently been derived from the DR-10 specifically for the DJI Matrice drone. The parachute is mounted in a carbon cage and is released when a self-contained electronics system automatically detects an imminent crash. DR claims that their system works even in the event of control data link failure, and that incident data is collected in an on-board UAV flight-data recorder for subsequent analysis. 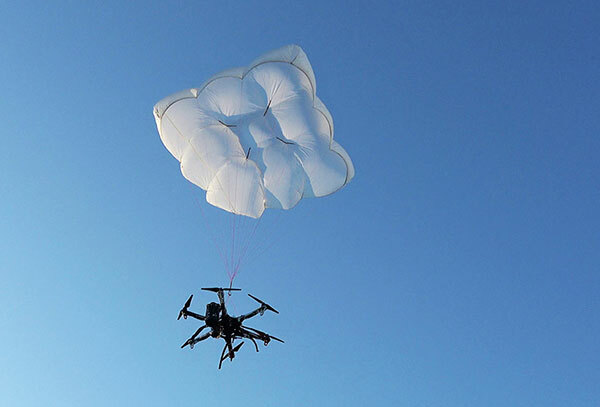 It was previously announced that an FAA waiver for flight over people was granted to North Dakota UAS operator, Botlink using a ParaZero Israel drone recovery parachute system. Initial flights were conducted during a tailgating event prior to the North Dakota State University vs South Dakota State football game in North Dakota. The drone flew over crowds in the stadium’s parking lots and provided real-time video for local law enforcement and media companies. This drone parachute safety system includes a fully autonomous triggering system that deploys quickly and reliably without being dependent on any manual operator’s response. During FAA testing it was necessary to demonstrate that the descent rate was slow enough to provide acceptably low impact energy and that the system would operate correctly in multiple types of failure conditions. Meanwhile, DHL has joined other drone delivery companies to establish a medical delivery trial in Africa. DHL’s trial is in the Lake Victoria region of Tanzania. The six-month trial has focused on delivered medicines by UAV within 40 minutes to an island in Lake Victoria — the trip normally takes six hours by road. Over the course of 160 proving flights, using a 4-kg-capacity Wingcopter, medical supplies were successfully transported over the 60 kilometers between Mwanza and the hospital on the island of Ukerewe. The medicines reach their destination at least 3 hours earlier than by any traditional mode of transportation, and as a result of these tests, 400,000 people in the Ukerewe District will now have access to medical care and support in hours rather than days. Drones helping out hurricane Michael recovery efforts in the Florida Panhandle, specialized drones tracking sharks to mitigate possible attacks off beaches in Australia, parachute recovery systems enabling drone flights over people, the integration of drones into regular airspace moving ahead, and more medical delivery trials in Africa. These are a few recent UAV applications that appear to be supporting even further drone use around the world.